Representatives from the federal Environmental Protection Agency (EPA) met with the San Jacinto River Coalition and interested members of the public last Wednesday night at the Flukinger Community Center in Channelview. The purpose of the meeting was for EPA to present a status report on efforts to remediate the Toxic Waste Pits in the San Jacinto River near the I-10 bridge. About 100 persons attended the meeting, mostly residents from the east and west sides of the river adjacent to the waste pits area. They heard Gary Miller of the EPA explain new actions to repair a tear in the containment membrane, and additional requirements on the Responsible parties. These include 24/7 surveillance by camera, additional warning buoys and markers, and increased inspections on-site from 2 to 4 per year. Miller described a process that for many residents has been drawn out too long. He said that a Draft Report on possible remediation methods is due in December 2016, and a Final Decision in the Spring 2017. The audience was not happy with this schedule, and spoke up. Pam Barta, a former resident of Highlands whose family has suffered serious health problems, possibly from contaminated wells, asked why not deal with this on an Emergency Status. She wanted all fishing stopped immediately, toxin tests carried downriver to the Galveston Bay, and a shorter time schedule for action. She said water wells should be ordered shut down. Her own survey showed residents who look like we are in a War Zone – missing limbs, skin diseases, and more. Very Sick people. She attributed these problems to the dioxins in the waste pits. A representative of the Harris County Polution Control Department, Bob Allen, said the county is taking proposals, due Feb. 22, on testing of wells in the area, and this would include dioxin screening for the first tiime. He said this testing is being paid for by settlement money from the lawsuit against the Responsible Parties, not taxpayer money. Scott Jones of the Galveston Bay Foundation said that the results of these tests would be posted publicly on his organizationss website. Gary Miller said that the EPA had a lot of concerns about the quality of work done last year on the cap, by the Responsible Parties. He indicated he would personally supervise future work on the containment at the site. A number of other questions were asked by the audience. Scott Jones wanted to know how the site could be protected from barge strikes. Another party wanted to know how a widening of the I-10 bridge might affect the Waste Pit site. However, he said that sampling taken around the tear after the repairs, indicated that no toxins had been released, and no dioxin was in the river water. The issued was disputed by Jackie Young, who said that her orgainization tested wells and found dioxin. EPA ended the evening promising more frequent meetings and a shorter remediation schedule. Bill Murff, 80, of Crosby, was born November 13, 1935, in Limestone County, TX and passed away Tuesday, February 9, 2016, in a local hospital. He was a graduate of Brazosport High School and Sam Houston State University, where he received his Bachelor of Science Degree in Agriculture and Master’s Degree in Education. 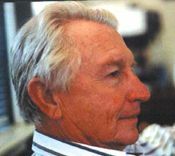 He taught agriculture at Jones High School and Furr High School in Houston, and then Crosby High School while farming on the side. He turned his love of farming into a fulltime occupation, transitioning from teaching to farming. He was the owner and operator of Murff Turf Farm in Crosby. He was a former longtime member of the Eastside Church of Christ and a current member of the Northeast Church of Christ. He was proud of his Crosby community and was a member of the Crosby Historical Society. He was a longtime board member of Crosby State Bank and then CommunityBank of Texas. He was also a Florida College board member and a member of the Tuesday morning breakfast club at the Baytown Cracker Barrel. He was preceded in death by his parents, Martel and Daisy Murff. He is survived by his wife of over 52 years, Elaine Murff, sons and daughters-in-law, Scott and Jenny Murff and Lindy and Amanda Murff, and daughter and son-in-law, Renee and Steve Martin, all of Crosby; brother and sister-in-law, Jerry and Murial Murff of St. George, UT; grandchildren, Dustin and Jordan Martin, Abbey and Jack Murff, and Noah, Emma, and Cooper Murff; and numerous friends. His family will receive friends at Navarre Funeral Home Friday from 5:00 p.m. until 7:00 p.m. Funeral services will be Saturday, February 13, 2016, at 10:00 a.m. at Eastside Church of Christ, 3107 N. Alexander Dr., Baytown, TX 77520, with Tony Mauck officiating. A private burial will follow at the Evergreen Cemetery in Crosby. Serving as pallbearers will be R. D. Burnside, Dwight Chaney, Johnny Enderli, Mike Thomas, Mark Walker, and Greg Wallace. To view the online obituary or to post a tribute for the family, go to www. navarrefuneral home. com. HIGHLANDS  A large crowd was on hand last Thursday night, as the Highlands Lynchburg Chamber of Commerce held their annual Awards Ceremony and Installation of Board and Officers. The featured speaker was State Representative Wayne Smith, and the presigious Terry Davis Award was presented to Highlands Resident Archie Bickley. Bickley attended with a large contingent of his family and friends. Bickley is well known in the community for his service to various organizatioins, and his work with the Sampson Masonic Lodge. The Terry Davis Award, given each year to someone who has shown outstanding service to the community, and is determined by a popular vote of Chamber members and the public. Chamber executive director Jessica Woods mentioned Bickleys presence at many community events, such as annual clean-up, food drives, youth sports, scouts, and holiday celebrations in the park. The awards ceremony was held at Monument Inn, and the emcee for the evening was outgoing president Traci Dillard, and later new president Jim Wadzinski. Judge Mike Parrott, in the last year of his term before retirement, swore in the new and returning board members. State Representative Wayne Smith was the keynote speaker of the evening. 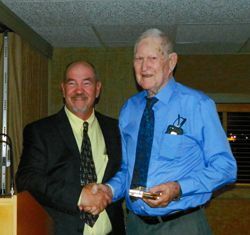 He welcomed the guest and new board, and then told of his years as a civil engineer, a veteran, a resident of Baytown for 40 years, a Rotarian, and in the 84th Legislature he was chair of the License & Administrative Procedures committee. He then covered the highlights of the session. Awards were presented by new president Jim Wadzinski. Jim then proceeded to outline a plan of action for his term as chairman in the coming year, including improving government relations, getting to work with the school districts, helping decide how to use the waste pits monies, and restoring the Chamber building. CROSBY  The community once again rallied and showed their overwhelming generosity and support of Crosby Fair and Rodeos Tough Enough To Wear Pink event Saturday, February 6 at the Crosby American Legion Hall. Preliminary reports show about $135, 000 was raised at the 5th annual Bras For the Cause event. Denise Martinez of Houston Methodist San Jacinto Hospital described the poignant impact on cancer victims and how the patient assistance fund allows the hospitals cancer center to provide financial help to qualifying patients undergoing treatment at their facility by paying third party vendors for items such as mortgage/rent, utilities, transportation expenses, nutritional supplements, and necessities. 100% of proceeds will benefit the Pink Heals Endowment Fund which keeps funds local and supports cancer patients in our community thanks to sponsorship of the Teresa and John Matt, All State Documents, Holmelin Family, silver Wings Foundation Crosby fair & Rodeo, Hotchkiss Disposal Service, Lone Star Signs, Sammy and Sandy Chitty, Houston Methodist San Jacinto Hospital, Pipeline Bar and Grill and Washabeeria, Naomi Michalsky and Patients emergency Room. 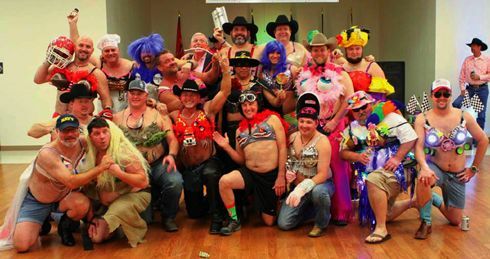 20 male celebrity models participated in a fashion show modeling bras designed by family and friends. Some of the themes included, Nascar, Game of Thrones and Crosby Cougar Cowbells. Teaque Schexnayder modeled the Chiquita Banana bra which brought $35,000 and was bought by Oilwell Tubular. Tim Dodge, a Pink Heals Fireman, modeled a Jimmy Buffet, Margaritaville bra designed by the BFC committee. Tim drives the pink fire truck, Debbie and his bra was purchased by Kay Schexnayder, the October 2015 Pink Heals honoree and her daughter, Heather. Jayne Clifton designed a beautiful quilt that included t shirts from past years of our TETWP events. The quilt sold for $4,500 to Tony and Kris Dahlquist. Don Nelson, former news anchor from Channel 13 served as M.C., Elbert De la Cruz was DJ and Bill Busby served as auctioneer. Gary Clifton welcomed the sold out crowd and Denise Martinez from Houston Methodist San Jacinto told personal stories of how Pink Heals funds have helped local people in the last year. Jennifer Loggins served as photographer and Demeris Catering provided the meal. HIGHLANDS  The Harris County Pollutions Control Services is currently advertising for a contractor to test 40 wells in the Highlands and Channelview areas, near the San Jacinto River Waste Pits. Bids are due Feb. 15th at the county. This opening date has been postponed twice. According to bid documents, all 40 wells must be within 3 miles of the Waste Pits site, and will be tested for standard drinking water analysis, as well as analysis for dioxin/furan, volatile organic compounds, semi volatile compounds, pesticides and selected metals. The approved contractor is forbidden by the agreement to disclose the results of the tests, verbally or written, to outside individuals or entities. The locations of the wells to be tested will be determined by HCPCS. Jackie Young of the San Jacinto River Coalition reports that the tear in the membrane over the Waste Pits has been repaired by the PRP, or Potential Responsible Parties. A new membrane and overburden of crushed concrete has closed the 25 x 20 foot hold that was discovered in December by divers employed by the EPA. Two meetings regarding the Waste Pits have been scheduled this month. On February 8th the San Jacinto River Coalition will join with the Galveston Bay Foundation to hold a meeting at the Highlands Community Center, at 6:30 p.m. The meeting is in conjunction with the Texas Parks and Wildlife Department. The purpose of the meeting is to update and educate the community about the ongoing process to select projects for the $10 million dollars in settlement funds that the State of Texas received from the Waste Pits litigation. SJRC suggests that possible uses for the money would be a renewed infrstructure for Highlands water distribution, or a new community boat ramp, or projects to restore the marshland and habitats endangered or destroyed by the Waste Pits. In additon to the state money, Harris County Precinct 2 has pledged to use their $10 million in the area for community benefit projects. A second meeting on the Waste Pits has been scheduled by the EPA, in cooperation with the TCEQ, to hold a Superfund Open House meeting on Wednesday, February 17 from 6:30 to 8:00 p.m. at the Flukinger Community Center on Lorenzo Street in Channelview. On hand will be federal, state, county and local officials to partipate in the meeting. This informal meeting is to update the community on the EPAs remediation process, ongoing studies and recent events at the site located on the west bank of the San Jacinto River directly north of the I-10 Bridge. Agency officials will also update the residents on upcoming activites, the site schedule and what to expect next. The U. S. Environmental Protection Agency (EPA) in cooperation with state, county and local agencies is continuing to assess current and future site conditions to develop a comprehensive plan for site cleanup. As part of the EPAs oversight responsibility, and to verify the condition of the cap, EPA divers completed an underwater inspection of the armored cap on December 10, 2015. The inspection found an area on the northwest part of the cap where the armor cap was deficient. This underwater area does not have a geotextile liner under the rock, and a gap in the armor cap resulted. The EPA directed both International Paper and Insudtrial Maintenance Corporation, the potentially responsbile parties (PRPs) for the San Jacinto River Waste Pits Superfund site in Harris County, to submit a repair plan for the protective cap.The EPA prescribed that the repair plan should include confirmation sampling to assure the EPA that no materials have been released from the site. Following EPA approval of the PRP delineation and sampling plan, the PRPs completed work to mark out the length and width of the deficient area, as well as collect sediment samples. The deficient area was irregularly shaped approximately 20-feet by 25-feet in size located under water from 8-inches to 18-inches deep. A total of seven shallow sediment samples were collected inside and outside of the deficient area. The samples inside the deficient area contained rocks as well as sediment and shells. The samples are being analyzed for dioxin/furan congeners with results due in February 2016. In addition, three split samples were collected by EPAs contractor and will be analyzed by an independent laboratory. Oversight of this work was provided by EPA staff and contractor. Harris County staff also viewed a portion of the work in progress. Following the EPAs approval of the repair plan, the PRPs completed the work to lay a geotextile fabric over the deficient area and cover it with a 1-foot minimum thickness layer of armor rock with an 8-inch median diamter. Manual probing was done to confirm that the minimum rock thickness was achieved, and additiona rock was added where needed. Oversight of this work was provided by EPA staff and contractor. 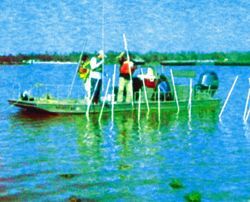 Following completion of the work, the PRPs performed underwater survey of the repaired area. KEMAH  When demand for your services are increasing by 15% or more each year generally that is a good service but this time the good is within the men and women that perform the service. Crosby Volunteer Fire Dept. answered 1018 calls last year, that increase was mostly within the Crosby fire district. At a special recognition dinner at Landrys Restaurant Saturday, Chief Alan Kulak, Fire Marshal Kevin Pipes and officers of that department recognized just some of the distinguished records of those serving with them. The Ladies Auxiliary recognized each of the firefighters individually. 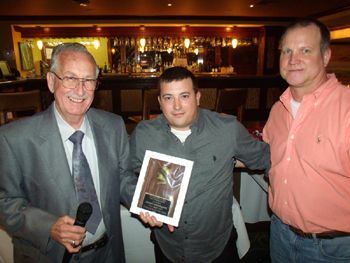 Jerry Brogdon was Firefighter of the Year and recognised for making the second most calls. Russell White was again recognised as Officer of the Year. Hernando Andrada was recognised for 25 years of service and Dwayne Ringo for 10 years. Andrada was unable to get his work detail relieved that night. Chief Kulak recalled recruiting Ringo at the Apaseo Restaurant blaze. Chief Kulak says that there is plenty of reason to join other than helping the community. Many volunteer move on to become paid firefighters. Like Ringo, it is especially helpful to have E.R.T. experienced volunteers from the petrochemical industry as that experience is helpful in rapid progression through the qualification for firefighters. This year Health and Fitness and Rookie of the Year got special recognition. Warren Thompson received a FitBit monitor on behalf of his contribution in health and fitness preparation. And Kimberly Delgado, first female firefighter recognized by the department, was Rookie of the Year.